Deputy T. D. Mick Hart started his law enforcement career in 2005 with North Carolina Central University Police. While at Central he was assigned to patrol and earned a certification with the Law Enforcement Bicycle Association and a Police Segway Certification. In 2008, became a deputy with the Durham County Sheriff's Office. 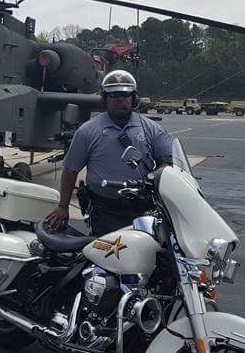 Deputy Hart joined the Motor Unit in May 2015 after completing the Durham Police Department's Basic Police Motorcycle Operator Course. Deputy Hart holds his Intermediate Law Enforcement Certificate and serves on the sheriff's office Hostage Negotiations Response Team. He also holds current certifications as a Radar Operator, Bike Safe Assessor, SFST, and various other law enforcement certifications. Deputy Hart is a SGT 1st Class in the US Army Reserves after serving 14 years of active duty beginning in 1988.